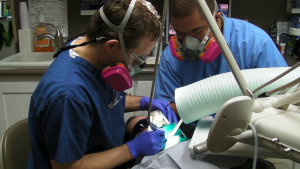 When a patient asks us to remove their mercury fillings and replace them with biocompatible restorations, we follow extensive safety procedures. After all, mercury is extremely toxic – on par with substances such as arsenic and lead. Mercury toxicity has been associated with a broad range of health problems, from behavior and mental health issues to autoimmune disorders to neurodegenerative conditions. Mercury is most dangerous when inhaled as vapor, absorbed into the lungs and introduced to the body’s general circulation, where it’s drawn toward fatty tissues, such as those of the brain. And removing mercury amalgam fillings generates a lot of mercury vapor. New research in the journal Dental Materials offers the latest evidence of just how much “a lot” can be. For the study, researchers used a device called a spectrophotometer to measure the amount mercury in the air before, during, and after amalgam removal. Measurements were taken for 13 patients who had a total 13 amalgams removed. Before the procedure, measurements were below 400 ng/m3. This is already four times higher than the maximum permissible level of exposure set out in US guidelines – and not exactly uncommon in dental clinics that don’t follow mercury-safe procedures. Much of that contamination comes courtesy of the drilling needed to remove the amalgam. In the current study, once procedures began, mercury levels shot up as high as 8500 ng/m3 – more than 20 times higher than at the start. And things didn’t improve much after removal. 15 min. after total removal of amalgam from the mouth, the values obtained were between 2,000 and 5,000 ng/m3. This is why we insist on safety measures that protect our patients, ourselves, and our planet. This is why Dr. Wall is certified in the SMART technique for safe amalgam removal. We believe mercury has no place in dentistry. Yet even if amalgam were universally banned today and biocompatible materials were the new norm, we would still be dealing with mercury amalgam’s effects for many generations to come, thanks to the countless mouths still harboring countless toxic fillings. It’s why mercury safety is a must – and one thing we will never, ever compromise on.